Samira Quraishy reviews Alan Hart’s courageous 2 volumes discussing what he states is the primary source of anti-Semitism in the world today – Zionism and the state of Israel. In today’s world of democracy and free speech, of globalisation and universalism, of Western hypocrisy and interference, there is a voice echoing slowly but surely amongst the morally aware. The voice of freedom, of justice, of realisation-realisation that one cannot sit back and witness daily atrocities in areas of the world that the Western powers deem to be insignificant. Palestine is one such land, one such people who have been oppressed for over half a century. Alan Hart’s epic two volume book extensively charts a history of the land as has never before been seen. Zionism: The Real Enemy of the Jews is a complete re-write of the accepted history of the on-going conflict in Palestine and sets out to debunk the myths that have been oozing out of Israel since its creation. Hart, a former Middle East correspondent for ITN and BBC Panorama presenter, dedicated five years of his life researching this subject and provides a different view of history, untainted by Zionist propaganda and myths. 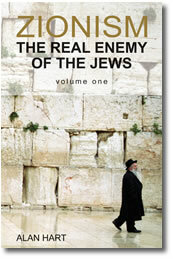 From the outset, Hart emphatically establishes that there is a significant difference between Zionism and Judaism. The Zionism that is used in the title refers to the political theology of Zionism that is in stark contrast to the spiritual form of Zionism. 2. The reason as to why the Arab and wider Muslim world is ‘an explosion of frustration and despair’ biding its time. Hart’s readable account of history, his obvious erudite analysis and his ability in bringing the factual conflict to life on the page ensures the readers interest is unwavering throughout. His passion and empathy with both sides is apparent. For the Jews, the ‘unspeakable fear’ of another Holocaust due to Zionist manipulation and tyranny; and for the Arabs and Muslims, the anger and humiliation they are feeling everyday that Palestine is being torn apart and trampled upon.